I may have two Credit Put spreads on, say one that is 20% below the price of an Index and another one 10% below the price of the Index. It is true that I have some risk on but returns don't come at the expense of doing nothing. You have to take risks and in the end all I'm betting on is probabilities. Yes, eventually I will get burned. Eventually. But the cost of not taking advantage of the oversold opportunities over and over again throughout the years is much greater. In addition to the March SPX 1965/1970 Credit Put spread, I also saw the SPX 1845/1850/2170/2175 unbalanced Iron Condor expire for max profit. 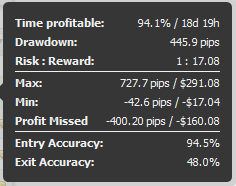 With these results the portfolio return for March was a solid +3.07% after commissions and now the account is up +7.36% year to date. The S&P500 is up +2.39% during the same period. The SPX index went from 2055.35 to 2108.10 this week and now the markets are back in No Man's land. Looks on its way to overbought territory but not quite there yet. This neutrality is not ideal for selling individual credit spreads on one side of the market. For that reason I opened an Iron Condor instead as the first play of the May cycle less than 48 hours ago. My next play will be a Credit Spread whenever the market reaches a short term price extreme. If that doesn't happen (it has only happened once this year) then I suspect I will go through another boring long period of doing nothing but baby-sitting Iron Condor positions. 4 weeks to expiration and 88% probability of success. Looking great. I am not concerned with this position. Very young position initiated 2 days ago. 8 weeks to expiration and lots of baby sitting ahead. Patience is the name of the game. None of the Iron Condors will need adjustments for the time being. As for new trades, the market needs to reach an extreme. Either SPX 2030 or 2150 to get me interested. Looks like I won't enter new trades in the next few days. The LT Trend Sniper closed its second position of 2015 after the Euro had its best day in more than a year on Wednesday. Seeing a huge part of the profits evaporate is not fun, but as a trend follower, staying in the position for as long as possible, giving it time to work is the only formula for maximizing winners. It could be said that in order to have large winners you have to be willing to give away part of your profits. Sounds crazy. The best way to maximize, in the long term, is by not imposing arbitrary Target Profits that will potentially cut some winners short. The Sniper is up +17.52% for the year and it should have 3 - 4 more positions left in 2015. Of course I expect some losses at some point as typical for any trend following methodology, but for sure they will be smaller than the winners. In other words, with these results the LT Trend Sniper system pretty much guaranteed a positive return already for 2015 even if it loses all the positions left in the year. Folks, I removed the Investing Accounts from the Track Record page in spite of the fact that they were doing pretty well (up more than 20% since inception 17 months ago). The reason for this decision is that I won't be able to add fresh capital in a long time. Longer than I expected. They'll be like ghost accounts with no activity. I initially thought I would be unable to add fresh capital for just 4 - 6 months until my situation in the US was stable. But, just this week I decided to aggressively save for the down-payment for a house in Florida. The goal is to save 50K - 60K as soon and aggressively as I possibly can and that will prevent me from adding fresh capital to long term stock investments in at least 18 more months. I won't remove the Investing related articles from the site. I won't stop talking about the subject either. But any small amount of capital that I may have left in the near future will go to my Options and Forex trading accounts where the strategies are much less capital intensive. Of course, I will not sell my dividend paying, long term investments. I planned to hold them forever and that was not a joke. But because there won't be long term investing activity for a long time, it kind of stops making sense to track a performance and actively compete with the markets when I'm really doing nothing at all. For the time being the results page will go back to Options + Forex only and I'll try to make it cleaner and easier to understand with less clutter. On a final note, this may be the last article this month. I'll be moving to the US next weekend. The next article will most likely come out on Saturday April 4 from Floridian soil. That's unless I have to make an adjustment earlier to any of the existing positions or unless the markets go completely haywire and tempt me to add a new credit spread position. Good luck folks! Trade smarter, not harder! Most new credit spread traders fear the downside more than the upside. It should be the opposite. Credit spread probability of success is actually higher if you open new put spreads during times of extreme market volatility. Market sell-offs are a great time for a savvy trader to turn calamity into opportunity. If SPX goes up to 2160, I will sell May 31st 2250/2260 ccs to iron condor with 1775/1765 cps. If RUT goes up to 1300, I will sell June 1400/1410 ccs. If SPX drops to 2050, I will sell June 1800/1790 cps. If RUT drops to 1215, I will sell June 1050/1040 cps. Good luck with you move LT!! Sunny Florida !!! I like your plan @bellinimarkets. Those are really good positions. IC RUT May 1070/1090/1330/1350: Monday, 60 days to May expiration. RUT 1240 in the upper part of Bolinger Bands. RVX 18 in the middle of BB. Sold to open 4x ICs RUT May 1070/1090/1330/1350. 1090 puts has delta < 10. 1330 call had delta < 10. Total credit received 2.54. IC SPX Apr 1850/1870/2200/2220: Wednesday, the position showed open profit of 75% of credit received. Bought to close the whole position for 0.60. Originally sold for 2.54. IC SPX May 1860/1880/2190/2210: Thursday (after FOMC), 57 days to May expiration. SPX 2090 in the middle of BB. VIX 14 in the lower half of BB. Sold to open 4x SPX May 1860/1880/2190/2210. Sold 1880 put and 2190 call had delta under 10. Total credit recieved 2.70. CAL RUT Apr/May 1230: on Friday, RUT reached the upper expiration BE of the single calendar. Rolled half of RUT Apr/May 1230 call calandar spreads to RUT Apr/May 1270 call transforming the single calendar into a double calendar. CAL RUT Apr/May 1230/1270: the recent fall of volatility cut the max profit of this position in half. I may close this position for a scratch this week. IC RUT Apr 1050/1070/1320/1340: I will try to close this position at 3/4 of max profit. However, if RUT keeps rising, I may need to adjust this position at around 1280. IC RUT May 1070/1090/1330/1350: new position that is safe so far. IC SPX May 1860/1880/2190/2210: new position that is safe so far. LT... Good Luck with your move to Florida. Welcome to the United States, my friend!! !